More than 50 attendees from 31 companies representing over two thirds of the wind power owned and operated in Italy have taken part to the first edition of the O&M Italian Forum on Performance and Monitoring, held in Rome on December 2nd. Forerunners of the event, BaxEnergy and ROMO Wind have brought together -for the very first time ever- key exponents of the Italian Wind Energy Industry, from Enel Green Power to EDF Energie Nouvelles, from ERG to E2i Energie Speciali and many more, to discuss and shape the future of Operations and Maintenance (O&M). Focus of the Forum was exploring the different processes, activities and emerging projects related to the O&M Performance Monitoring field, so to debate and identify the best way to optimize data analysis, improve energy production and increase assets performance and value. These have been the main topics addressed by the speakers, from Maurizio Suraci and Fabio Corbo bringing in their experience driving ERG, to Ludovico Terzi from Renvico, from Francesco Bedani of DNV GL, to Luca Alemanno of ROMO Wind and Vincenzo Carbone broadcasting BaxEnergy’s vision of the future of O&M, during the intense discussion panel followed by an interactive round-tables and Q&A session that has raised the interest and the proactive participation of the audience. “In this unique environment, we wanted – as BaxEnergy – to share our vision on how to innovate the future of O&M through our turn-key solution Energy Studio Pro® and the brand-new AssetStack™, that combined together become valuable a unique business-enabler platform for a number of activities that goes far beyond performance monitoring, rather creating a solution that integrates a family of products as different pieces of the same puzzle”, proudly affirms Vincenzo Carbone. 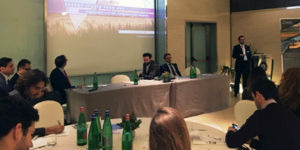 Looking back to the overall success of the O&M Forum and the positive feedback of its participants, BaxEnergy team is working to lead the way towards new futuristic projects, ideas and thematic workshops with the aim to create remarkable synergies in the Italian landscape and in the broader energy market.